Looking for the maximum-performance RUV? Look no further. 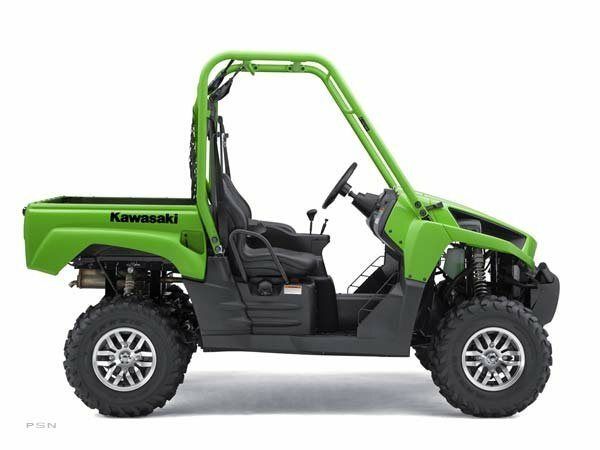 Think of the Teryx™ 750 FI 4x4 Sport as the hot rod of Kawasaki’s Recreation Utility Vehicle (RUV) family. The Teryx Sport is ready for serious off-road fun right out of the box, with clues to its substantial performance in plain sight – lightweight alloy wheels controlled by high-end multi-adjustable, gas-charged shocks. 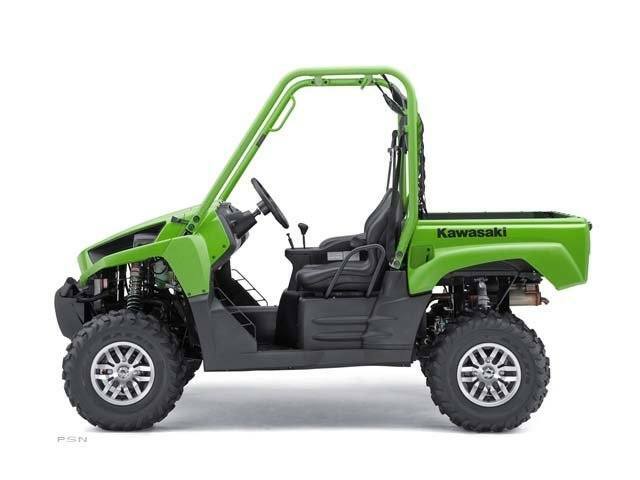 The uprated suspension and wheels extend the Sport’s off-road ability by delivering a high degree of wheel and chassis control even through seriously rough terrain. So whether you’re hammering along a rocky, bumpy desert two-track or hightailing it on a narrow, bumpy trail in the woods, the Sport makes short work of the nasty terrain so drivers can focus on the fun. The engine is positioned mid-ship, providing optimum front / rear balance and optimum traction. Electronically controlled Kawasaki Engine Brake Control helps to slow the RUV when traversing down hills. Aluminum cylinders are electrofusion-plated for lightweight, long wear and excellent heat dispersion. Teryx’s liquid-cooled, 749 cc SOHC, four-valve-per-cylinder fuel-injected, 90-degree V-twin engine cranks out class-leading power. Oversquare (85 x 66 mm) engine with four-valve heads contributes to the Teryx’s superb acceleration and torque. Ignition cut-out feature protects the brake system by preventing riding with the parking brake on. Coolant reserve tank is located under the front cover for easy maintenance. Engine can be started in any gear, as long as the brake pedal is depressed. Thermoplastic Olefin bodywork has a great-looking high-gloss finish that’s more scratch-resistant than polyethylene so it stays great-looking longer. Dual 40-watt headlights and 8/27-watt dual taillights mean you’ll see and be seen. The high-pressure fuel pump located inside the tank features a unique reservoir chamber at the bottom of the fuel pump that ensures air does not get into the fuel system. Digital fuel injection enhances throttle response and automatically adjusts for changes in temperature and elevation for optimum performance in a wide range of environments. The fuel injection system is controlled by a 32-bit ECU and continually monitors coolant temperature, air intake temperature, throttle position, air intake pressure, vehicle speed and crankshaft angle to automatically meter out the ideal amount of fuel via two 34 mm throttle bodies for extremely stable power delivery – regardless of conditions. Specific Teryx-sized throttle bodies and optimized ignition timing have maximized low and mid-range torque and ensure excellent response at high rpm. FI system permits easy engine starting at low temperatures and utilizes an Automatic Idle Speed Control and Automatic Fast Idle function to help ensure smooth engine warm up. The padded steering wheel is positioned low for sport riding and provides additional driver protection. High-performance aluminum-bodied gas-charged piggyback-reservoir shocks at all four corners are fully adjustable for spring preload, compression damping and rebound damping for a completely tunable ride. High-performance cast aluminum wheels remove approximately two pounds of unsprung weight from each corner for a performance boost you can feel. Kawasaki’s sealed, oil-bathed multi-disc rear brake system provides maximum stopping power in almost any condition along with reduced maintenance thanks to its being completely sealed from outside contaminants. The CVT Belt Protection System prevents tire freewheel, improves rocky terrain performance and reduces belt overloading by adding Throttle Position Sensor (TPS) data to the system. Featuring high and low ranges, plus reverse, this advanced Continuously Variable Transmission (CVT) provides a direct feel from the engine and instantaneous acceleration – ideal characteristics for sport riding. Transmission utilizes a high-grade, super-durable belt designed to handle the high output of the engine. The drive converter shaft is hard chrome-finished for durability. A large intake duct, located to keep water and debris out, provides plenty of cooling air to the CVT. Lightweight cast aluminum wheels offer great looks and cut unsprung weight by 2 pounds per wheel. 26-inch Maxxis tires developed specifically for the Teryx help provide great traction and handling. Standard on all models, the multi-function dDisplay includes a digital speedometer (mph or kph), clock, dual trip meters plus 2WD / 4WD indicator, water temperature and fuel-injection warning indicators, digital fuel gauge, hour meter, parking brake indicator, CVT belt warning, neutral, reverse and low oil pressure warning lights. Even with its wide track and large tires, the Teryx is compact enough to fit in the bed of most full-size pickup trucks. Large, 7.4-gallon (28 liter) fuel tank and excellent fuel efficiency provide the range campers and hunters need to get deep into the bush – and back again. Limited-slip front differential reduces steering effort under normal 4WD operation, while Variable Front Differential Control permits the rider to distribute torque equally to left and right front wheels for maximum traction via a hand lever located between the seats. Selecting 2WD or 4WD is as easy as pressing a switch located on the dash; electrically selectable 2WD / 4WD system engages instantly. Rear torsion bar helps minimize body roll. Independent rear suspension provides an ideal balance of rider comfort and handling at high speeds. High-performance, aluminum bodied, fully adjustable, piggyback reservoir, gas-charged Kayaba shocks provide excellent fade-resistant damping performance in the toughest conditions while providing 7.5 inches of plush, controlled wheel travel. Reinforced bed frame offers maximum rigidity for excellent durability. 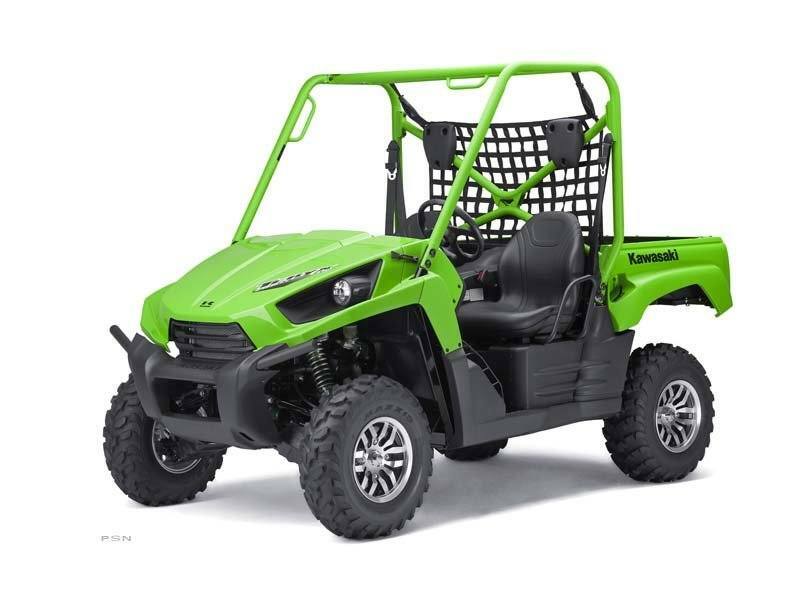 With a 500-pound capacity, tilting cargo bed, tie-down hooks in all four corners, a standard cargo net and generous dimensions, the Teryx is as functional as it is fun to ride. Performance-focused suspension is designed for high-performance riding. Chassis has 11.6 inches of ground clearance, which strikes a perfect compromise between great low-CG handling and the ability to clear tough off-road obstacles. A hinged, forward-tilting front hood and headlight assembly highlights aggressive styling and allows quick access to the radiator and front suspension components for easy maintenance and suspension tuning. The tilt bed’s frame is engineered with extra rigidity for a high degree of durability. Tubular cab frame meets SAE J1194, 7.1.1, 7.1.2, 7.4, and 7.5, requirements as a Roll-Over Protective Structure (ROPS). Wide track helps provide a great ride, but unit is narrow enough to fit in a standard pickup truck bed. Large-diameter thin-walled tubular steel frame combines high rigidity, lightweight and mid-engine placement – a perfect combination for performance riding. Narrow frame concept maximizes the length of the front and rear suspension’s lower A-arms for excellent road-handling performance and minimal geometry change throughout the suspension’s travel.